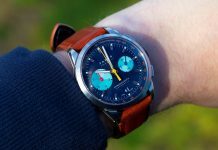 Last year Zenith created what they called a technical triumph, what most others called a ‘let’s see where this goes.’ I of course mean the Defy LAB, an insane-looking version of their flagship watch with a unique, cutting-edge oscillator. Now, two years on, we get our hands on the production version, the Zenith Defy Inventor. First of all, the looks of the thing. It’s been toned down a good amount from the original concept watch, with the previous piece’s Aeronith – essentially aluminium foam – used on the bezel alone. The rest of the 44mm case is brushed titanium, making the piece far more accessible to look at, to wear and ultimately to buy. At the centre of it all however is the almighty Zenith Oscillator. Rather than the usual spring and balance wheel assembly, Zenith’s horological tour de force is a single piece of silicon that vibrates at an insane 18hz, up from an already impressive 15hz in LAB version. 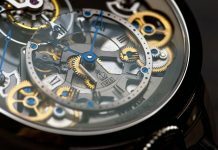 It replaces the entire standard balance assembly and is visible through the skeletonised dial. I have mixed feelings about the Zenith Oscillator. It’s a remarkable achievement and shows why so many brands are incorporating silicon into their movements – it’s anti-magnetic, consistent to produce and far, far more reliable – but I just don’t like looking at it. Because it wobbles in place it looks broken, like something has come loose. The previous concept made up for that with a tick like a helicopter, but here it’s far, far quieter. If it were hidden by a solid dial, I’d be all on board with this. As I said, it’s an intriguing piece of watchmaking; put it in an Elite and I’d be sold instantly. As it stands I’m not so sure. The same can be said of the Aeronith bezel, though I have to say when used in moderation the polymer-filled aluminium foam is growing on me. That all said, closing the dial would be a shame; the latest versions of the Defy using that web of anodized bridges is seriously cool, particularly in the blue here. Sure I’m asking a lot of the designer, but dammit if I don’t feel entitled. I’m not of course, but still. More importantly than what the Defy Inventor looks like is what it represents. When the LAB came out, Zenith declared it a huge leap in watchmaking. The problem is, that only works if you can actually bring it to production. Anyone can make a money-losing concept. The Defy Inventor however looks like it just might have proven Zenith correct. For more information visit Zenith’s website. 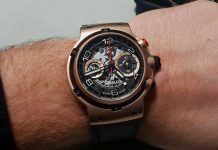 Share the post "Hands-On with the Zenith Defy Inventor Watch"